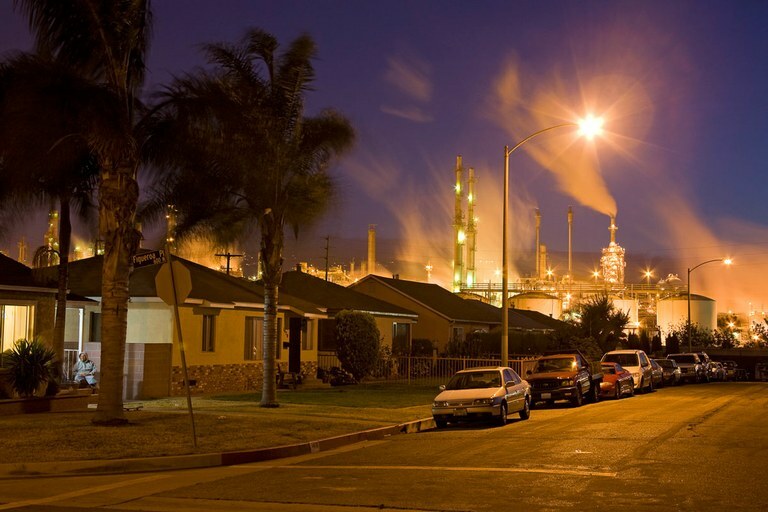 Residential houses are situated next to an oil refinery in Los Angeles’ Wilmington neighborhood. Communities for a Better Environment in Wilmington is one of three local organizations documenting environmental health hazards. Boyle Heights, a working-class neighborhood east of downtown Los Angeles, was one of the city’s most culturally diverse areas in the 1920s, when it was home to Japanese, Jewish and Chicano families. Today, it is 94 percent Latino, with a population of about 100,000. But its 6.5 square miles weren’t designed for today’s traffic and population density, or for the odd mix of industrial and residential uses the area’s been known for since the turn of the century, when the railroads first took over this part of the city. 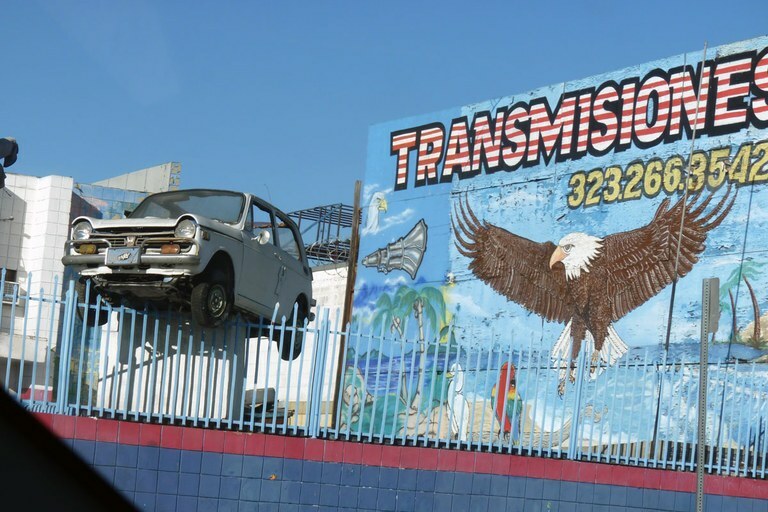 In Boyle Heights, auto-mechanic garages stand side-by-side with steel manufacturers and car detailing shops, only a short walk away from schools and a major freeway interchange, where an estimated 2.4 million vehicles pass through every day. Adults exposed to such industrial and traffic-related pollution are more likely to have strokes, get cancer and develop cardiovascular disease, while children face higher risks of asthma and chronic lung disease. According to the Environmental Protection Agency, more people die prematurely in the Los Angeles area from air pollution than in any other urban area in the country. In polluted neighborhoods like Boyle Heights, long-term residents have struggled to find a reprieve, short of leaving their homes, even as local policies that might impact pollution have struggled to keep up. In 2008, Liberty Hill partnered with grassroots groups in three heavily polluted working-class and immigrant neighborhoods: Unión de Vecinos in Boyle Heights, Pacoima Beautiful in Pacoima, and Communities for a Better Environment in Wilmington. Like citizen scientists, local residents in each place headed out on foot to document the hidden and toxic hazards in their neighborhoods, from oil refineries to heavy traffic, as well as any sensitive land uses — factory buildings in or near residential areas, for example — that hadn’t been registered by local government agencies. This auto shop in the Boyle Heights neighborhood in Los Angeles would be subject to guidelines prompted by “ground truthing” efforts. Auto body shops would only be able to operate outside a 500-foot buffer from residential areas. They dubbed their effort “ground truthing,” and measured and mapped toxic and cumulative exposure alongside data on their communities’ own so-called social vulnerabilities, from disparities in age and health to those involving culture. What that ground truthing discovered was that there were many more hazardous waste facilities and metal-plating factories operating next to homes or schools or parks than Vilchis or public officials knew about. So, armed with their new, on-the-ground data, the community groups went to their city council and made a strong case for stricter rules. Since cities in California have zoning control, the activists called for changes to the code to at least limit the growth of these industries and curb the already-existing toxic threats in their backyards, where pollution levels exceed safe standards. After their elected representatives voted to take on the new proposals, residents from the three Los Angeles neighborhoods designed a series of key rules: auto body shops would only be allowed to operate outside a 500-foot buffer from residential areas; small factories would have to build enclosures for their toxic emissions; and high air-filtration systems would have to be installed in any new commercial or residential developments located close to a freeway. Only businesses that complied with these zoning rules would be given permits by the city. The coalition is thinking beyond these neighborhoods, now: It’s been instrumental to Los Angeles’ first sustainability plan, too, which now highlights both public health and economic well-being in urban neighborhoods that had long struggled to get cleaner air. And this year, its initiative is expanding beyond Boyle Heights and into other parts of the city, Los Angeles County and to the rest of the state. “Los Angeles has really helped to push the envelope, and the ideas and ambitiousness of these solutions are coming from small groups,” said Liberty Hill’s Prichard. Whether these solutions are the be-all-and-end-all of intractable urban challenges is another matter: In Boyle Heights, Unión de Vecinos is trying to tackle everything from air pollution and the lack of playgrounds to residents’ displacement due to gentrification. That homegrown activism certainly has made groundbreaking gains in Boyle Heights: In February of last year, the neighborhood was the site of the first-ever collective bargaining agreement reached between tenants facing eviction and a rich developer in Los Angeles. After all, residents believe they have the right to stay in the neighborhoods they’ve been working hard to clean up for so many years.